All transactions are safe and secure with a reliable history in online purchasing behind each of our associates. Buy the This is Muppet Country t-shirt to own Fear and Loathing clothing and merchandise. These Muppet Country Hunter S. Thompson t-shirts are an obvious play on "Gonzo" Journalism. You might run across these two at Bazooko's Circus, a fictional circus-themed casino in Las Vegas. Raoul (Johnny Depp) and Dr. Gonzo (Benicio Del Toro) go inside Bazooko's Circus while they are high from an ether binge. Depp's character lets us know that Bazooko's Circus reflects a deeper meaning, stating, "Bazooko's Circus is what the whole hep world would be doing Saturday nights if the Nazis had won the war. This was the Sixth Reich." 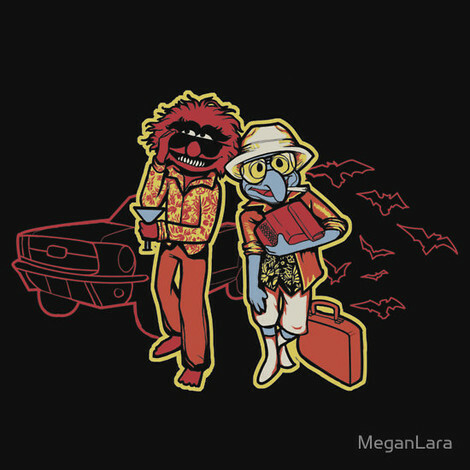 In addition to the This is Muppet Country tee above, browse the Fear and Loathing Clothing Gallery for more apparel like men's and women's clothes, kids shirts or hoodies.